Sometimes life is hard. There are days when you feel bogged down with the ins and outs of every day life and the stressors that brings – little annoyances that threaten to push you over the edge. Things that aren’t massively important in the grand scheme of things, but in the moment you feel so frazzled that you don’t know what to do or where to turn. Let’s face it, we have all been there. Those are the kind of days that end with you crying in the shower. Nothing to be ashamed of, really. We have all been there. But then there are the days that are worse than the frazzle that is the every day. There are days that leave us feeling so broken in our body that we can’t stop weeping. Days where we have received life shattering news about a family member or a friend, or even ourselves. Those days are weeping days. Those are days where we can’t even crawl out of bed. We can’t even face living life on those days. Everything has stopped, suspended in in time – frozen for a moment that seems to last forever. I had one of those days last week. The day itself wasn’t bad – perhaps a few annoyances here and there. But then I received some devastating news. Two of my friends have cancer and it doesn’t really look good. And then, not long after that news, a text from a friend that her sweet blessing was born still. It has been a week and I still can’t even think about it because I am the kind of person that when tragedy strikes, I need to step in and help if I can. Sometimes God provides me with a way to do that, and sometimes…He doesn’t. How can you help a situation like that? How can you DO something when there is nothing to be done except trust in God’s plan? A few weeks ago, I posted a little graphic on Facebook – you know, one of those things you see that gives you the feels, or that you can just really relate to – so you share it. I liked this because I have been there before myself and I have had so many of my own plans fail. Proverbs 16:9 says “we can make our plans, but the Lord determines our steps.” I don’t know about you, but the Lord has determined my steps all over the place and I am not stepping anywhere I thought I would be. 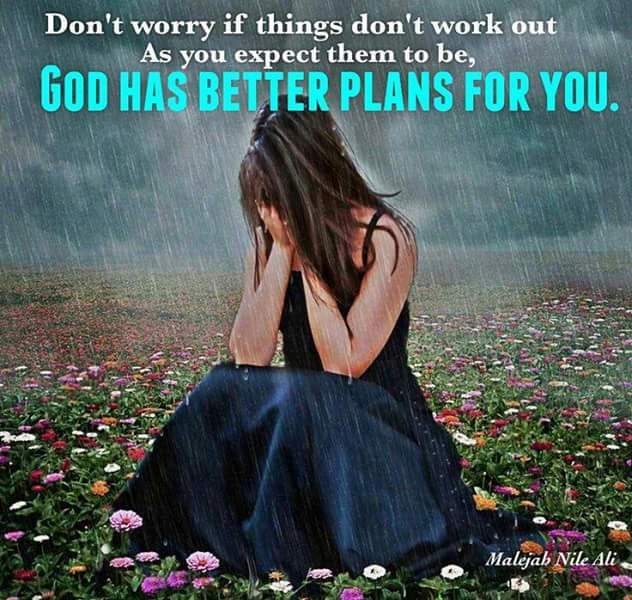 But that’s okay, because I really do trust He has better plans for my life. I know it is not always the case for everyone. In fact, when I posted this, one sweet friend who must have been having a frazzled day wrote – “well, what are they then?” In the moment it made me smile. I have been in that spot before. Hello, Lord – I know you have a plan, but I am freaking out a bit because it doesn’t quite match up with mine. Can you help a girl out? The truth is, if we stopped being selfish for just a minute, and looked back over our life we could see how His plan for our lives unravelled. And that every good thing comes from Him. But that is another topic for another day, today we are weeping. The pure and honest truth is that even when we are weeping, His plan is unravelling. Even when we can’t see the good in the situation, it is part of His amazing plan for our lives. Or our friend’s life. Or a family member’s life. A few years ago, a friend of mine went through one of the worst situations a parent could go through. Her healthy daughter went from running around with other kids to the point where they thought they were going to lose her in the span of a few days. They had lots of weeping moments. Devestating and heart breaking moments. I am sure in those moments it was hard to trust God’s plan. But miraculously, His plan was for that sweet thing to LIVE. And now she walks around with a magnificent and mind boggling story of God’s healing power that will follow her throughout her entire life. A testimony that she can use to bring others to Christ. When you are in a situation that causes you to weep, sometimes the worst happens. Sometimes it is hard to see God’s plan in he midst of it all – when things keep piling up, and bad news gets worse. Sometimes, God’s unfolding plan means the end of a life in this world. Such was the case for another friend of mine. Oh, how I miss her deeply. When she shared that she had cancer, it seemed so unreal. She was so young and very healthy. Heartbreakingly, it was only two short years later that she went home and left behind her sweet husband and two sons. And her other family members who still struggle with her death as I write these words. Her funeral was packed – and there was a lot of weeping. My soul ached for them, and any other person whose life she had touched. But do you know what? She DID touch lives. She witnessed to many people as she took each blow with grace and peace. Coworkers, nurses, friends – her life was a testimony to them. Her life was a testimony to me, too. I only hope I have half of the grace and peace that she had as I deal with my own health issues. The worst part about situations like these is that there is no explanation as to why it is happening. Why do people get cancer? Why do babies have to die? We do not have answers, and so we weep. We cry until all our tears are gone because of the uncertainty. Because of the unexplicable pain. Because of the heartbreak. Because it seems there is nothing good in it. But you know what? Even in that weeping, even in the pain – there is hope. When you are weeping, when you are faced with a terrible circumstance, there are three things we can remember. He is there, He hears prayer, and He deserves our praise. I promise you, even in the darkest moments He is there. He is present and His love outlasts the end of all of our days, whether they be short or long. Matthew 28:20b says, “And be sure of this: I am with you always, to the very end of the age.” When I read that just now I got that Buzz Lightyear voice in my head that says, “to infinity and beyond!” Because while it doesn’t apply to Buzz, it does apply to the Almighty God. Forever and ever and ever and ever and ever…. Love unfailing and never shaken – strong and powerful. In the weeping moments, He is there. 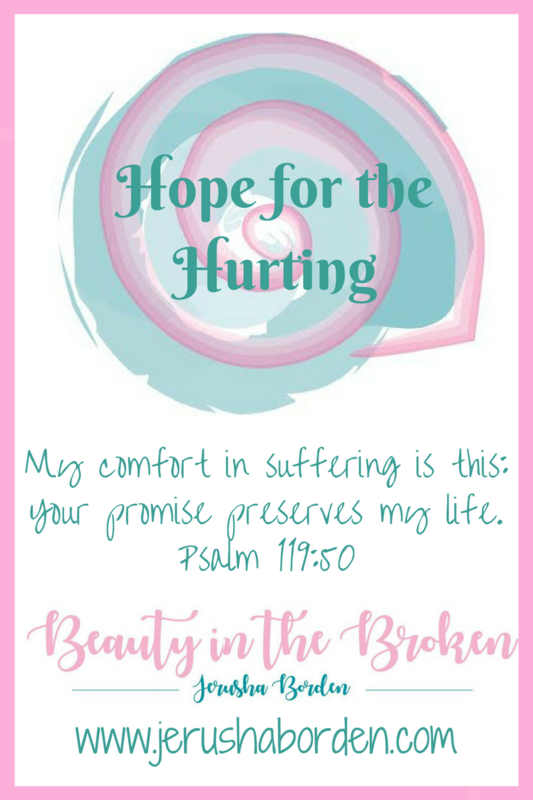 When I have cried all my tears, and my heart seems slightly less broken – when I have a moment where I can actually breathe and think, I like to remember this verse in Psalm 147:3, “He heals the broken hearted and bandages their wounds.” Oh, that He would bandage our weeping souls. And while He is in the valley with us, holding us, He hears our prayers. Even when we can’t even find the words to pray, He hears our hearts. Romans 8:26b says, “for we do not know what to pray for as we ought, but the Spirit himself intercedes for us with groanings to deep for words.” Can you just close your eyes and think about that with me for a minute? When we just can’t even…when our hearts are so broken we can’t pray for one single second – the Holy Spirit, who knows us intimately, prays for us. Sometimes, all we can do is to whisper His name. I remember sitting with a friend, going through something together and just feeling so broken and spilled out, all we could do was say, “Jesus, Jesus, Jesus.” That moment was so powerful. The Spirit was present and we felt so filled with peace. There is power in His name. And because of all of these things – all of His love, all of His peace, all of His interceding prayers, we need to praise Him. Even when it hurts. Even in the middle of the darkness. Now you might argue that if you can’t even pray, how can you praise – am I right? I have been there. In times like that, I pop on some worship music and just listen. Like I mentioned earlier, He sees our hearts. He knows them intimately. And you know what? When life is at its worst, and everything is broken, that is when we need to praise the loudest. That is when we need to climb mountains and shout His praise. When you do this, you will feel your heart lighten a little. The words and songs will come easier for you. And even though your lips may not be able to sing, your heart will. And when our heart is singing, even in the weeping, we truly know that no matter what the outcome, we will be okay.